The number of visitors to Peugeots Web Store, an Internet marketing site for new cars, tripled to more than 600,000 in November. PARIS -- Peugeot will rely more on Internet marketing of new cars to help counter the economic slump. 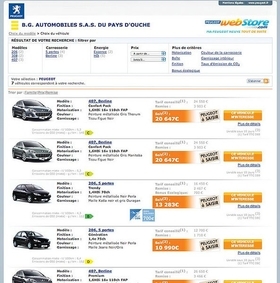 Launched one year ago, Peugeots French-language Web Store site (www.peugeotwebstore.com) allows Internet users to browse among 35,000 new cars available from the companys 400-member dealer network in France. Potential buyers can look for a car they like, find the best price among participating dealers and then arrange a meeting at a dealer site to work out a sale. The French carmakers online operation goes much further than those run by its European rivals, which generally use the Internet as an information tool for prospective customers. Most European carmakers limit online sales to used cars. Experts say Peugeots Web Store offers an indication of how the Internet could affect new-car sales and carmaker-dealer relations across Europe in the near future. The US currently is the leading online car market, with about 8 percent of new-car sales taking place over the Internet, according to Xerfi, a Paris-based market intelligence company. This is double the European online sales rate of 4 percent. Peugeots decision to allow dealers to advertise the vehicles they have in stock online appears to have had no negative impact on the network, said Guillaume Mouren, an automotive analyst at Xerfi. The Web Store actually helps dealers better manage their inventory, limiting the need for further incentives or passing on inventory to low-cost agents, Mouren said. Xerfi forecasts that online sales in France will grow by 20 percent to 40 percent annually over the 2009 to 2011 period, by which time Internet-based transactions should represent 5 percent of all new-car sales. Peugeots French customer relationship manager, Christophe Spitalier, said the number of visitors to the Web site tripled to more than 600,000 in November after a national advertising campaign. The site was averaging 200,000 visitors over the January to October time period. Spitalier said increasing the number of potential buyers versus casual Internet surfers is key to boosting online sales. What we learned is that targeted advertising really works when we want to create traffic among customers specifically interested in getting a good deal, Spitalier said. One in three Web Store visitors now fills in online information forms asking for follow-up contact, up from one-in-five before the advertising campaign, Spitalier said. Anywhere from 12 percent to 15 percent of Web Store visitors who request additional information about a car actually buy a car within three months, Spitalier said. Peugeot plans to widen its online product offering this year. It is also considering ways to take online reservations and allow clients to make deposits.